If you have been on the fence, or if you have purchased the PDF version and would like to upgrade to print please PM me directly. 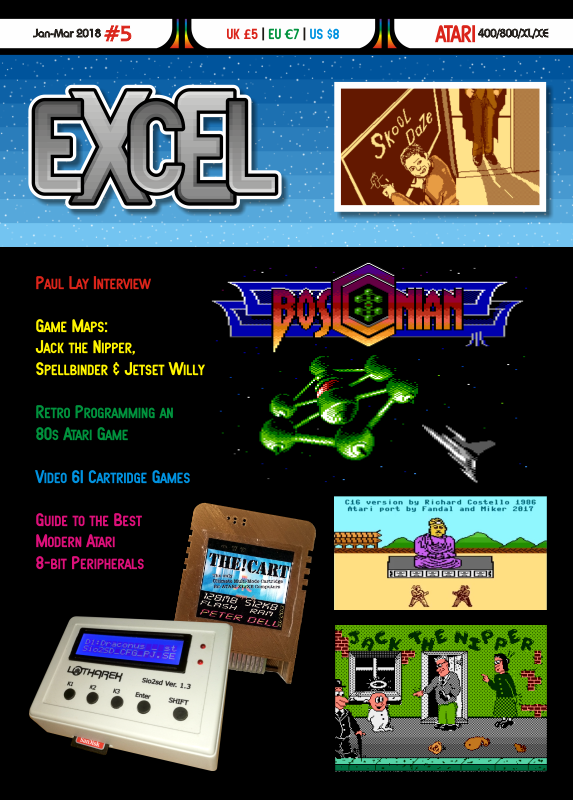 For interested non US customers please visit http://excel-retro-mag.co.ukdirectly. 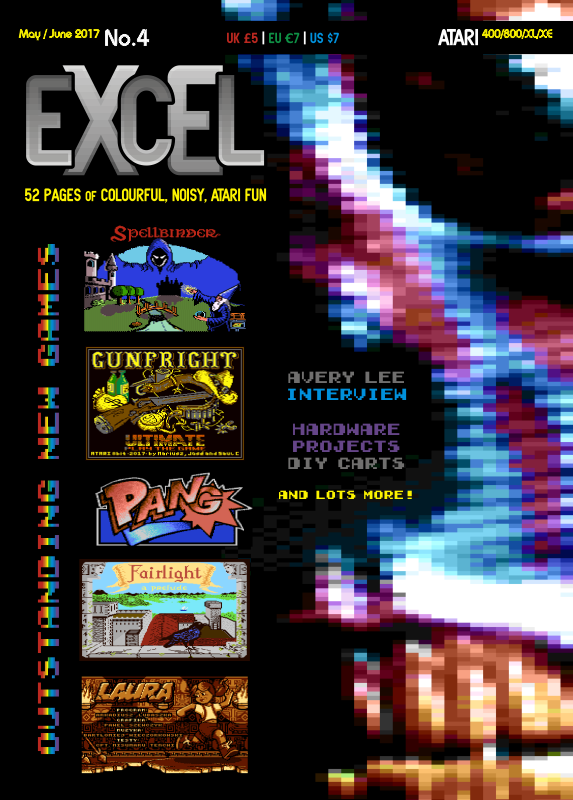 Excel is a full color, full size, professional quality Atari 8bit focused magazine. Edited by Mclaneinc, Fri Jan 25, 2019 9:09 AM. Looking forward to my bundle! This will make for some good "analogue" reading. Thanks! Very well done, a pleasure to look at and to read. Coffee table quality. They genuinely are, when I saw the first one I was blown away, its what you want from a mag, visually sumptuous, great quality paper and printing, articles that are very well written featuring past articles that many may have missed and just a great read. Its also nice that it has input from many in here so its almost an AA mag as well. I'll also chime in and I have all 5 so far. The quality of both the physical magazine and the content is top notch. I'm biased, but IMHO they are a must-have for any Atari Age 8-bit forum regular who love 8-bit games, classic and new. Even the guys that prefer programming and hardware hacking to gaming get DIY projects too, from some of our community best, like Flashjazzcat as one example. And all of us writers put our best foot forward because we do it for fun and the love of our Atari's. I'm never satisfied with my review writing myself, I did at least a half-dozen re-writes on all my reviews. And by the time I see them in print, I still wish I could have them back and do even better. I suspect that all who contribute would agree they feel the same. So the magazine will only improve. Look for issue 6 soon guys and thanks for your support! Issue #6 "should" be out in February but as always remember Bob is one guy and he has to put these together himself. I'm buying the bundle! Can't wait. Thanks to everyone who purchased a bundle. All full sets are sold, I do have a few copies of issue 2/4/5 - If anyone is looking to pick these up PM me and we can figure out a price. Edited by orpheuswaking, Mon Jan 28, 2019 12:45 PM. I just received my bundle. First word that comes to mind : excellent!! The magazines are truly top notch quality and I’m not just talking about the heavyweight glossy paper that is a pleasure to handle. I really enjoyed the articles I read on my first glance. There is a perfect balance of game reviews, historical article reprints, and modern hw/sw developments. Now I will go back there issue #1 and start reading properly, cover to cover. One comment : the game reviews are very positive with ratings like 8/10 to 10/10. Those ratings are warranted for those games because they are indeed very good games. Now show me a stinker that gets 3/10 and tell me why. I want to see the whole scale exercised to show the true value of a 10/10. Reviews are awkward, as an ex real world reviewer the initial reaction is to love your computer and almost love every thing that comes on it due to a loyalty bond but you really have to step back and look at the product. There are of course some great games out which warrant a good score but 10 / 10 should really be a rarity, add to that the obvious case of if its your sort of game or even a sort of game you don't like then the scores can be a bit risky as like or dislike takes hold. Edited by Mclaneinc, Tue Feb 5, 2019 10:18 AM. Agree! The reviews are indeed very good both in style and substance. I also understand that every page has a cost in terms of space and printing price. Why spend those precious resources to print a 2/10 review that seemingly bashes a software package that someone probably worked really hard on? We should be highlighting the best of the best, right? I still think there is a way (or there should be) a way to write a compassionate but critical review that takes into account a retrospective view. We can't compare a 1982 title to 1987 let alone 2019. However, there ought to be a way to compare a 1982 title to everything that came before it. There should never be a need to tear into someone's work but we can always say where the title missed the mark or could have done better relative to that time period. A review should always be honest and accurate, if a game has faults then list them but don't list them for the sake of destroying the game because you don't like it, they must be to point out failings that could be improved or be used for further titles. I never ever belittled an author because I didn't like what they had done, I looked at the good and bad and explained them. The last thing as a reviewer I want to do is stifle another persons creativity no matter what I think of it hence I hate reviews that say "this is the worst game in the world and should never have been written". Even if that was the case the author deserves another chance to fix and better themselves. We still get some amazing titles on the Atari 8 bit and we get the odd not so good one but its just nice to see people bothering.. Reviews of titles not up to par with the best could be made much shorter so they don't take up too much magazine real estate but the title is still fairly covered. Just a brief summary, a screenshot, and a reason for the low score. Maybe 4 per page or something. Obviously you haven't gotten around to reading my reviews of ABBUC contest software (issue 4, IIRC) I didn't pull any punches if the game stinks. 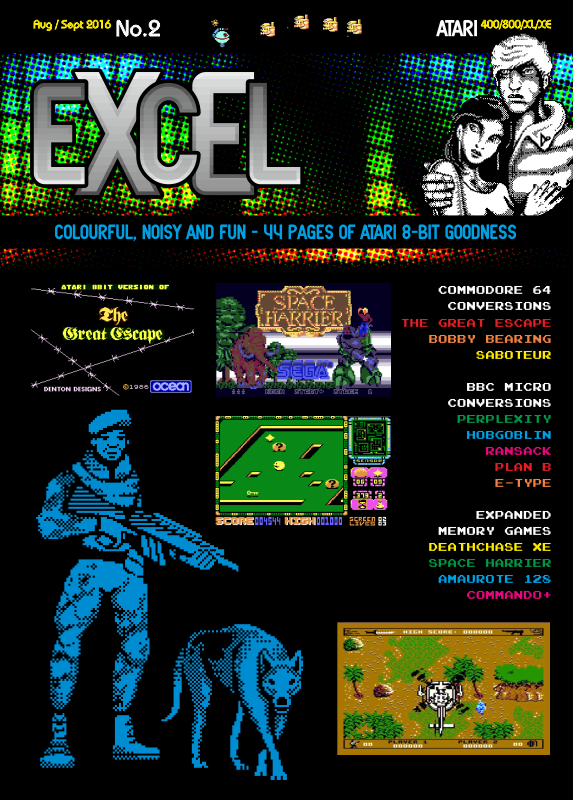 Issue 5 also has a review or two I wrote, not in the most glowing terms...but yes, most of the new home-brew games I've reviewed thus far have high scores because they ooze quality most of the time, given the time, care and attention Atari 8-bit games, especially ports from the C64, just didn't get back in the day. And except for the occasional stand-out killer app (Space Harrier, etc.) I think most should be compared to games done in the era, just to show how much better they can be when not done on a tight schedule with small budget and by people who programmed more on the C64 or other 8-bit than the Atari. The handful of games from back then, like Lucasfilm titles, Alternate Reality games, and others that were labors of love and/or with teams and big budgets, (and no two-week deadlines to get the port done from start to abysmal finish) that pushed the hardware still hold up perfectly well alongside new home-brew games. And the Atari versions were head-and-shoulders above all the other systems that got ports from the Atari instead of the other way around for a change. 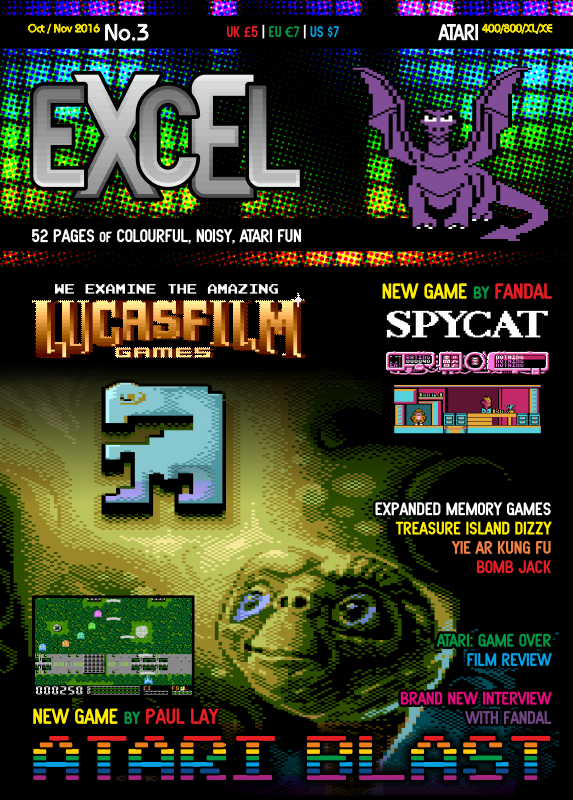 As yo will be able to compare yourself right in the pages of Excel since there was a huge spread on the Lucasfilm games and other classics already. Edited by Gunstar, Wed Feb 6, 2019 8:18 PM. It's nice to read people's feedback on the magazine! Of course, we concentrate on the newer games - which are on the whole very high quality programs created by real Atari 8bit enthusiasts and these obviously get higher scores. 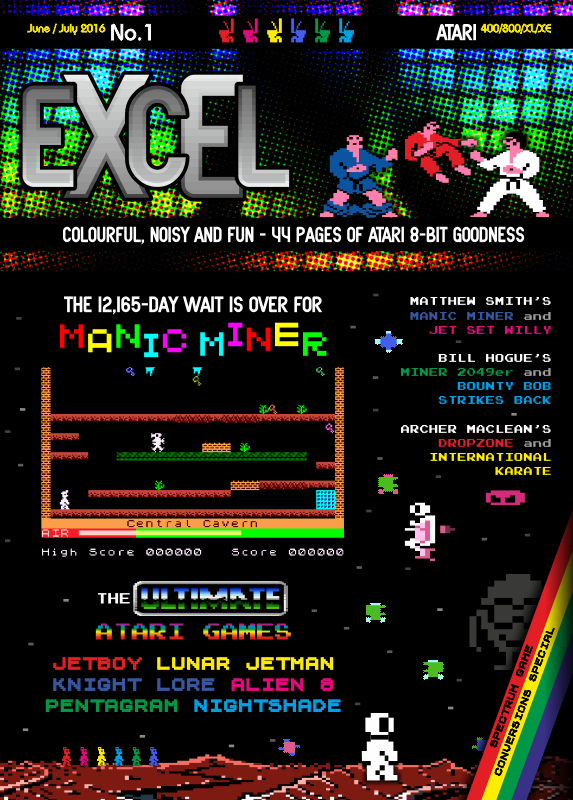 The reviews are also written by real Atari enthusiasts - nobody gets paid to write a review - the whole ethos of the magazine is a labour of love by people who adore these wonderful old Atari machines. We have had a few not-so-good reviews... but I wouldn't like to waste magazine space on games which are only worth 3/10... As Gunstar said, his Abbuc game reviews were very honest and a couple of the older games (which are rarely reviewed as there is so much good modern stuff to cover) didn't fare so well, i.e. Yogi's Great Escape and the original Jetset Willy. I did choose to review some of my all time favourites in the first few issues which were always going to get top marks - Bounty Bob, Dropzone, International Karate and the Lucasfilm games. We used to read about a games's "value for money" in the old days but most of the new games really are labours of love and cost nothing to add to your collection, which is quite a nice situation for us all. Long may it continue! And of course, one man's favourite game is another man's stinker! Edited by Bob The Bug, Thu Feb 7, 2019 2:20 PM.